Greek mythology states that Nisyros was once a part of the island Kos, but during the fight of the Titans, Poseidon plucked a part of Kos and threw it at Polyvotis, sinking him forever in the bottom of the Aegean Sea. This part of Kos, which crushed Polyvotis became Nisyros, and it is believed that when this half dead giant shakes and groans, the volcano erupts. These explosions shaped the island, which is considered to be the youngest volcanic centre in Greece, still active – along with the volcanoes of Milos, Santorini and Methana. Apart from being the capital of the island, Mandraki is also its harbour. It is one of the biggest villages on Nisyros with lots of tourism facilities available. Enjoy a stroll around the exquisite pebbled narrow streets and squares and take a close look at the white or coloured two-storeyed houses with wooden balconies. The houses are made of volcano rocks and insulated with pumice-stone. The nightlife is not very intense but you will surely have a good time in Mandraki, where there are little tavernas and some bars. 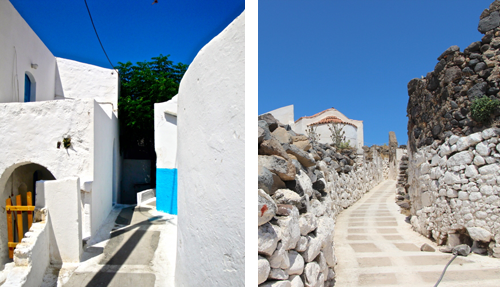 Located 8 km east of Mandraki, Emporios stands out for its houses’ architecture. It flourished during the 20th century when it had many inhabitants, shops (blacksmith workshops, groceries, tailor-shops, coffee shops) and skilled stone makers. During the ‘60s a great part of the population moved to the village seaport, Palloi. Porta is the main square of Nikia, where the church of Eisodion tis Theotokou [Presentation of Virgin Mary] is located; this is one of the most beautiful churches of Greece! The square has an ellipsoid shape and pebbled floor designed by Paschalis Paschalakis, a famous artisan of the 19th century, born in Nisyros. Walking through the village, you will find some nice spots looking at the volcano. Nikia is located 14 km south east from Mandraki. You may walk in the crater and watch the boiling holes. The most recent explosion took place in 1888, shaping a cylindrical pipe of volcano elements, with a diameter of at least 25 m. Polyvotis, the largest crater of the volcano, has a diameter of 260m and a depth of 30m. There are five younger craters, in the same area, the largest being “Stefanos" with a diameter of 30 m and a depth of 30m. The volcano surrounds a valley (caldera) 2,400m long and 950m wide. Visit the volcanological museum in Nikia, at the edge of the caldera, offering a unique view. It is well-equipped with samples and pictures of rocks, maps, diagrams, photographs, models of volcanoes, computer simulations and much more. Thanks to the technology you will learn about the volcanic activity of the area through three dimensional moving images. Α classical period acropolis of the ancient city(6th- 4th century) . It is still in very good condition because of its high quality construction and represents one of the best fortification works of the ancient times, basaltic andesite (volcanic rock), one of the hardest rocks in the world. The main gate is composed by well-hewn stone blocks with a perfect fit of the connecting surfaces. The western and northern part of the hill ends up in a steep and rocky shore which is the natural fortification. The total length of the fortification is very big, as it surrounds the entire land-lubber site of the rocky hill above the south end of Mandraki. Part of the defensive system with towers and observatories that run through Nisyros and the surrounding islets were used to warn through smoke or fire about forthcoming dangers. 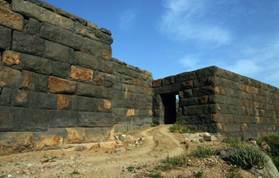 , built at the top of a hill northwest of Mandraki. The biggest part of the monastery is built in a cave. The cave is divided into two churches. The north is dedicated to the Kimisi tis Theotokou (the Assumption) and the south, Agios Charalambos (Saint Charalambos). 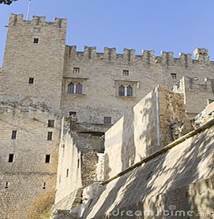 The Castle of the knights of St. John in Mandraki, built high on a rock at an altimeter of 150 meters. The castle is a reminder of the Knights of St. John having stepped foot on the island and built -in 1315- a magnificent castle in which nestles the Monastery of Panagia Spiliani dedicated to Kimisi of Theotokou (the Assumption). Basically, there are two scenarios for taking the boat to Nisyros. In the summer months the boats run from both Kos town (Eastern part of Kos) and Kardamena (Southern/Middle part of Kos). If you choose to take the boat from Kos harbour you will spend 1 1/2 hours to get to Nisyros, while if you choose to take the boat from Kardamena, it will take only 1/2 hour to Nisyros harbour. 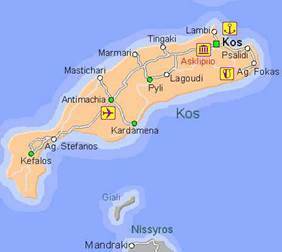 Kos is a small Island and it can be crossed relatively quickly in a taxi. Depending on which scenario you find yourself, the taxi ride to Kardamena is about 30 minutes from Kos town (cost of taxi will be around € 30-40). The destination for all of the Nisyros bound Boats is Mandraki Nisyros. The boats are generally very inexpensive and there is no need to make reservations on the boats. The thing to remember going back is to check the boat schedule well in advance. The name of the island probably comes from the pre Hellenic Aegean times. The first inhabitants of Nisyros were the Kares. They were followed by the Achaeans of Kos and the (Doric descendant) Rhodians. According to Homer, the Nisyrians were amongst the Greeks (Hellenes) that fought in Troy. The Nisyrians are also found in the taxation records of the Athenian alliance. They worshipped Apollo of Delphi and Poseidon of Pelasgui whose temple was found in what today is Palos where the old thermal springs were found. Preserved dedicatory columns tell us of the distinguished position held by Zeus, Hermes and many more deities in the daily worship of the inhabitants. 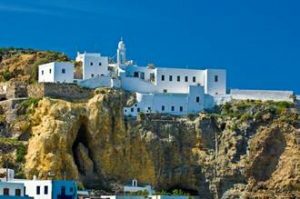 The historical fortune of Nisyros is common to other southeastern Aegean islands. The 5th and 4th centuries B.C. constitute the period of the greatest prosperity of the island. At that time, the island thrived on obsidian commerce, extracted by the inhabitants of Nisyros, from the nearby island, Gyali. During the Median wars, Nisyros paid tribute to Artemisia, to the Queen of Halicarnassus who was sympathetic towards the Persians. Later, and for a short period of time, the Nisyrians joined the ranks of the Athenians. They soon became independent and remained so until 200B.C. when they submitted to Rhodes and whose historical fortune they followed loyally ever since. The Ioannite Knights (Knights of the order of Saint John) fortified Nisyros in 1315A.D. building five forts in strategic positions on the island in the years that followed. In 1422, a huge volcanic eruption formed the large crater in the middle of the island. 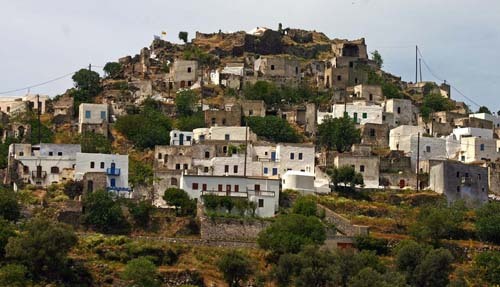 The Turks looted Nisyros at least four times until 1523 when they subdued it and together with the other surrounding islands, subjugated it to the peculiar privileged regime of the "maktu"(an annual fee that had to be paid). During the Hellenic (Greek) Revolution of 1821, the Nisyrian sailors and their vessels supported the sea operations of the Hellenes (Greeks) but Nisyros was not to be part of the then newly formed Greece. At the end of the 19th century and at the beginning of the 20th, the world wide Nisyrian expatriates provided a lot for the island which was unfortunately conquered by the Italians in 1912. It was in 1913 that the last eruption of the volcano occurred. After the second world war, Nisyros was finally conceded to Greece by the defeated Italians in 1948.